Baby Rhino Khanya at Baby Rhino Rescue | Adopt and Donate Now! Six month old Khanya arrived at Care for Wild Rhino Sanctuary by helicopter in May 2017. She was very dehydrated. Fortunately, she started drinking milk from the bottle within a few hours. The staff picked fresh green grass for Khanya to enjoy between her milk feeds. Three days after arrival, her blindfold was removed. She was amazingly calm when she saw the faces of those who feed her. The name ‘Khanya’ is Zulu meaning ‘light’: perfect for this little rhino who is full of energy and shows strong character. She is very clever and loves playing with whatever she finds. 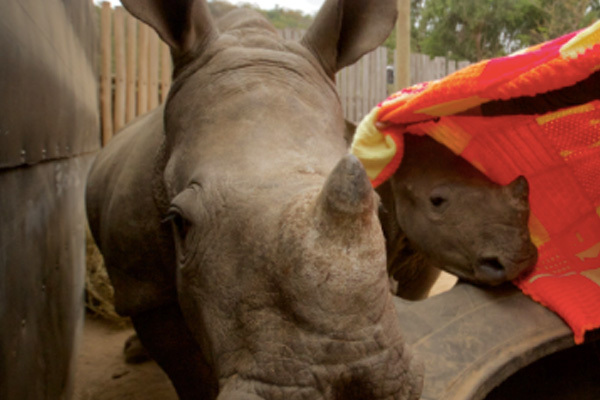 When Khanya was introduced to another orphan rhino, Rose-Petal, they instantly became friends. Another little rhino then joined them: Ruby-Belle. 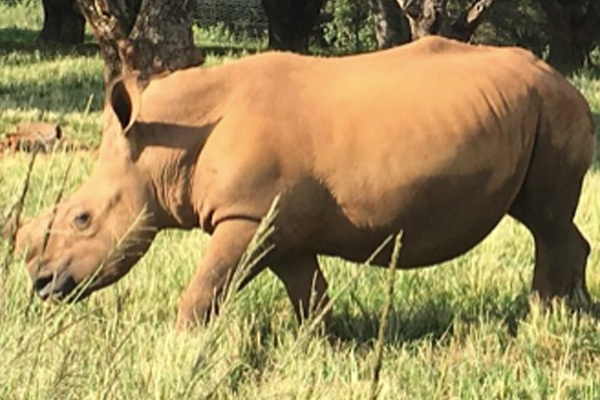 The three young rhinos are now in the big rhino bomas, going out during the day into the lovely fields at the back where they are free to roam, graze and play.